My husband and I commmissioned Tom to make a Colonial Computer Cabinet for us. 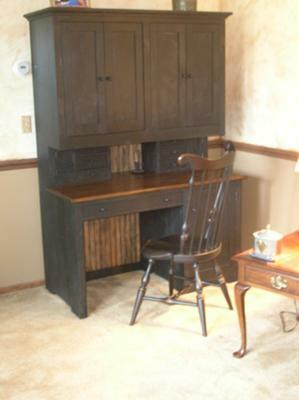 I provided a rough drawing and with Tom's help we designed a cabinet that worked with our decor and size requirements. Tom was a pleasure to work with from the start. He was very flexible in suggestions and revisions and provided drawings as needed. He even sent me emails with pictures of our cabinet in the different stages of his progress. That was a nice touch and very exciting to see. Tom finished on time. His craftmanship is wonderful. It looks wonderful! I'd recommend Tom for any furniture project!